Doesn’t it seem like black food is something that would best be avoided? Bound to taste like something singed, possibly with a charcoal element? Apparently, these anti-black-food feelings are at odds with current culinary trends, in which charcoal ice cream and squid ink pasta are helping to make black the new black in food fashion. Bloomberg reports today on “Why The Color Black Continues To Rule The Food World.” While charcoal ice cream was all the rage two years ago, black food has shown significant tenacity since then. Some chefs tell Bloomberg about their affection for squid ink, which offers an economical yet significant taste and visual impact. Michael Vignola at Henry At Life Hotel, who offers seafood in an inky black “nero sauce,” says, “Ingredients are so expensive, you can’t not get creative in finding ways to use all of your product. 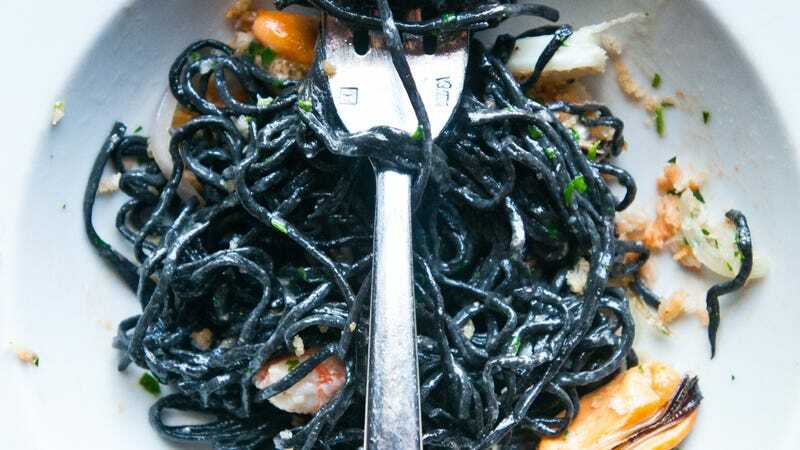 The ink from squid is a perfect example.” Hanoi House chef John Nguyen adds, “The combination of squid ink with seafood is such an Italian classic. It’s one of my favorite ingredients to cook with now”; he uses it to color his black crepes. Overall, it’s a pretty fascinating read about the different influences on various food trends, even down to a significant color that may seem unappetizing at first. Check out more at Bloomberg.com today.